Christopher de Leon used to live somewhere in Paliparan several decades ago. Sylvia La Torre used to own a house along Gen. Ordonez St when it was formerly known as Molave. The lot where the current BPI Gen. Ordonez branch is used to be where her house was. The late Helen Bela with Princess Punzalan and the rest of her family also lived in Marikina. The late Dindo Fernando also lived in Marikina in the '80's. I wonder if he's related to Bayani Fernando and the Fernando clan. Boots Anson Roa also resided in Marikina in the past. 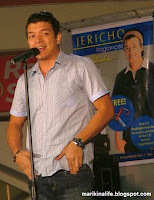 Jericho Rosales grew up in Marikina Heights and even worked at Concepcion market as a kid. Jeffrey Hidalgo, singer formerly of Smokey Mountain, and now solo artist still lives in Marikina. I see him once in a while at Starbucks Bluewave Marquinton. If you know more celebrities who live or used to live in Marikina, feel free to add to the list. If I'm not mistaken, Luz Fernandez, more known as "Luka" in Okay ka Fairy Ko sitcom, was also from Marikina. I often see her near my place back when I was in Highscholl. Of course Jay, you forgot Sonny Parsons ng Hagibis!! Kumandidato pa sya at nanalo naman minsan. Taga-SSS sya di ba? @hannah I didn't know about Luz Fernandez lived here. Saan kaya sa Marikina ? Oh yeah ! how could I forget Sonny Parsons ! kavillage ko paman din ! Thanks! @migs, celebrity na nakikita sa tv or on stage. sa internet lang ako sika <--- feeling ! LOL! MCS = Marikina Catholic School ? wow ! didn't know that. :) thanks for the info ! 1. April Boy Regino lives in San Roque Marikina. 2. Tado (Comedian yung laging nakasalamin na malaki) lives in Calumpang. May T-Shirt printing business siya doon. 3. Ada Lajara used to live in Gen. Ordonez St, Marikina Heights for 15 years :D LOL! hmmmmmm si luz fernandez sa parang sya. i know sina claudine barretto sa loyola grand villas nakatira na sakop ng marikina kase dito sila nagbabayad ng tax. as well as vince hizon and richard quan. gulat naman ako, natira pala sa paliparan i boyet de leon! wow ! a lot of other celebs live or lived in marikina pala. I remember myla gumila...kasabayan nina sheila ysrael right ? Saan sa Calumpang sina Lito and Zoren Legaspi dati ? @Zaldy: nagulat rin ako. di ko alam yun. tita ko nagsabi saken. si bobot mortis sa ivc, marikina nakatira naging konsehal din sya yrs. ago. plenty of celebrities who used to live in Marikina. Connie Reyes used to live in Horizon St. in SSS Village, near where Helen Vela used to live too. Robert Arevalo, Barbara Perez I know lives in Provident pero baka matagal na wala. Yung family ni Gabby Concepcion taga Provident din ata. Agot Isidro and family ay tubong Marikina. Angel Aquino sa may San Roque, Sta. Elena din ata. Raymond Marasigan is now our neighbor, ganda ng house niya, very modern.